The images featured on this site can be purchased as exhibition quality photographic prints produced on Fujifilm Crystal Archive Paper. This paper produces bright, crisp prints with unsurpassed world-class colour image stability. Ideal for meeting professional photographers’ needs for exhibitors, advertising and other commercial photo applications, this paper delivers rich tonal gradation, vivid colour reproduction, exceptional sharpness and unrivalled colour stability. These prints are not produced using inferior Inkjet methods, as is the case with some photographers. Independent studies carried out by the renowned Wilhelm Research Institute (http://www.wilhelm-research.com/) to simulate typical homeowner indoor display conditions, conclude that Fujicolour Crystal Archive beats the nearest competitors, Kodak and Agfa, when it comes to stability. Please note that the original camera format used to create the image determines actual print sizes and therefore size variations occur. As a rule the longest length on each print should be regarded as the minimum measurement. Prints can be supplied at larger sizes than specified here. Please email info@graeme-peacock.com for a written quote. The prints are available in either gloss or lustre finish. It is important to point out that the finished print colour or saturation may not be identical to that featured on the website. Great care has been taken to portray a true and accurate rendition of the image on the website, although the personal settings of a monitor and computer may well affect web images viewed by third parties. The prints are supplied without a border and are unframed. The choice of mount and frame is essentially a personal and subjective decision. (contact: Jeff Heads or David Cummings, tel: +44 (0)191 232 3558, email: info@digitalab.co.uk). All prints will be sent in tubes. Prints up to 36″x24″ are £6.95, sizes over this are £12.95. This is the contemporary way to hang canvas prints without the need for framing, and is incredibly popular with many photographers and artists. ” Images can be wrapped around the sides, the sides left white or the sides coloured to match the print. Please contact info@graeme-peacock.com to discuss. ” A standard £12.95 delivery charge is levied for UK mainland orders, and an additional £5.00 per additional product going to the same address. ” Outside of the UK a quotation will be provided for each individual order. All prices are quoted, and must be settled, in GB Pounds (£). 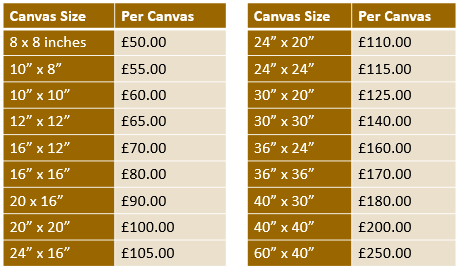 For prints sized 18″x12″ and smaller, 3 working days plus 1st class delivery. 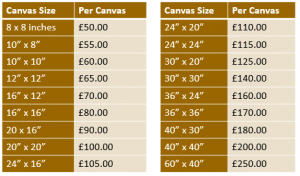 For prints larger than 18″x12″, 5 working days plus 1st class delivery. A next day delivery service can be arranged. Please contact info@graeme-peaock.com for further information. Prints are supplied rolled up in a cardboard tube. All orders for prints are confirmed by email. If the print is not to your satisfaction, then the price will be refunded in full assuming the print is returned in a saleable condition within 21 days of receipt (unless the photo is damaged whilst in transit). No statutory rights are affected. Any subsequent refund does not cover the buyer’s postage and handling costs. Please note that the purchase of your print involves ownership only. It does NOT infer or confer in any way a transfer of image rights. Copyright of the image remains in the possession of Graeme Peacock at all times. Purchase ownership does not permit in any manner unauthorised publication, copying, duplication, reproduction or exhibition of that image for retail or commercial purposes. The abuse and infringement of copyright is a serious legal matter and should it occur then the photographer will be obliged to take appropriate action.